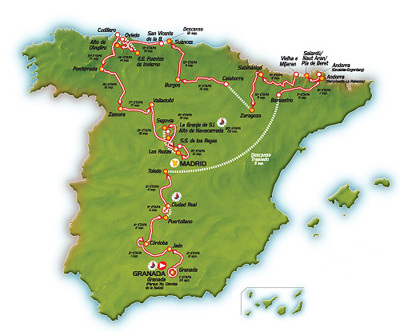 September 21: 21st and Final Stage, San Sebastian de los Reyes - Madrid, 102.2 km. Saturday, September 20: Stage 20, La Granja de San Ildefonso - El Alto de Navacerrada uphill 17.1 km individual time trial. 3. Alejandro Valverde (Caisse d'Epargne) s.t. 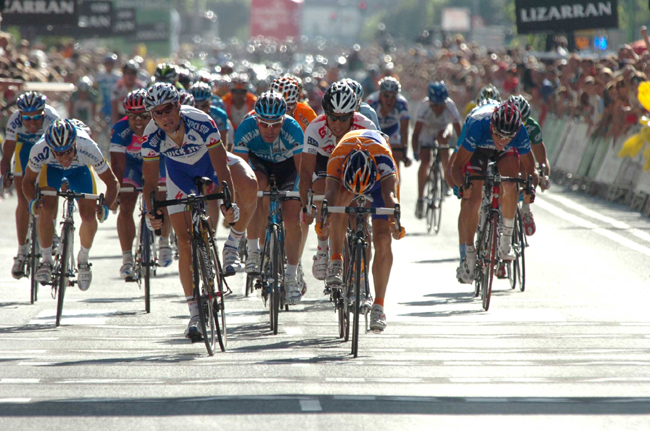 Friday, September 19: Stage 19: Las Rozas - Segovia, 145.5 km. 4. Alejandro Valverde (Caisse d'Epargne) s.t. 6. Marzio Bruseghin (Lampre) s.t. 7. Robert Gesink (Rabobank) s.t. 8. Ruben Perez (Euskaltel) s.t. 9. 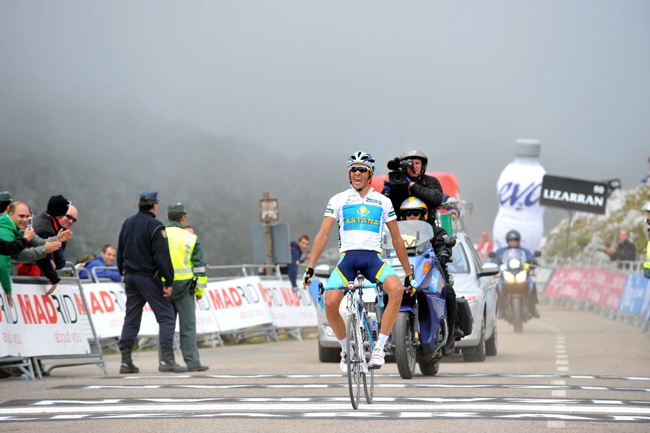 Alberto Contador (Astana) s.t. 10. David Moncoutie (Cofidis) s.t. Thursday, September 18: Stage 18, Valladoilid - Las Rozas, 167.4 km. 2. Nicholas Roche (Credit Agricole) s.t. 7. Enrico Franzoi (Liquigas) s.t. 8. Paolo Bettini (Quick step) s.t. 9. Andriy Grivko (Milram) s.t. 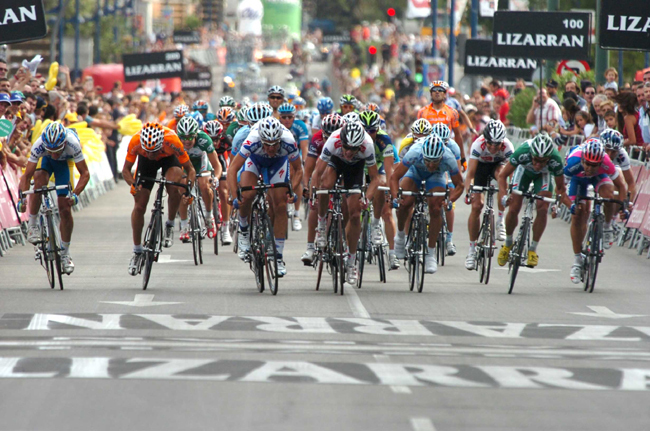 Wednesday, September 17: stage 17, Zamora - Valladolid, 148.2 km. 2. Matti Breaschel (CSC-Saxo) s.t. 5. Heinrich Haussler (Gerolsteiner) s.t. 6. Greg Van Avermaet (Silence-Lotto) s.t. 10. 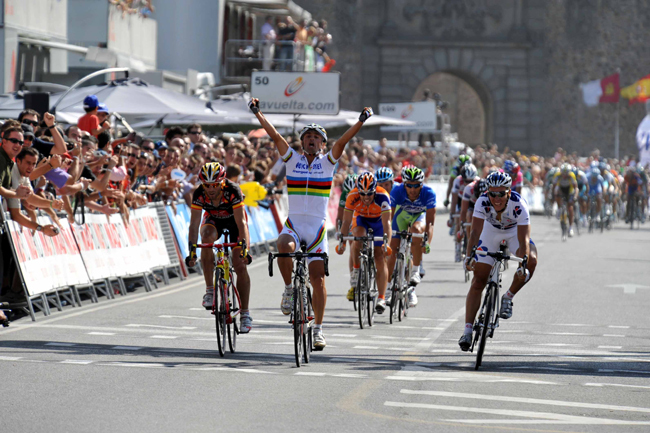 Claudio Corioni (Liquigas) s.t. 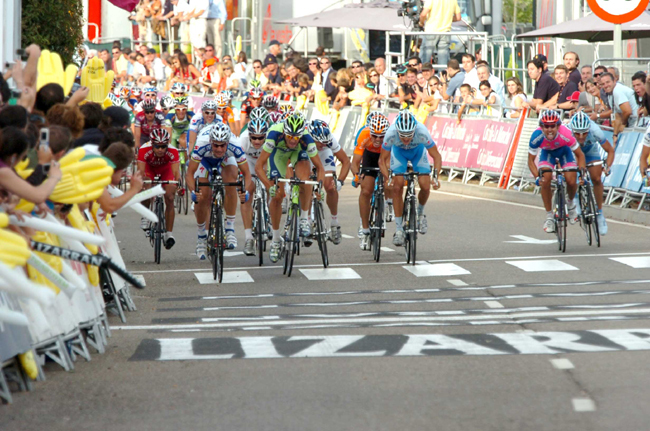 Tuesday, September 16: Stage 16, Ponferrada - Zamora, 186.3 km. 2. Filippo Pozzato (Liquigas) s.t. 4. Mickael Delage (FDJ) s.t. 5. Tomas Vaitkus (Astana) s.t. 6. 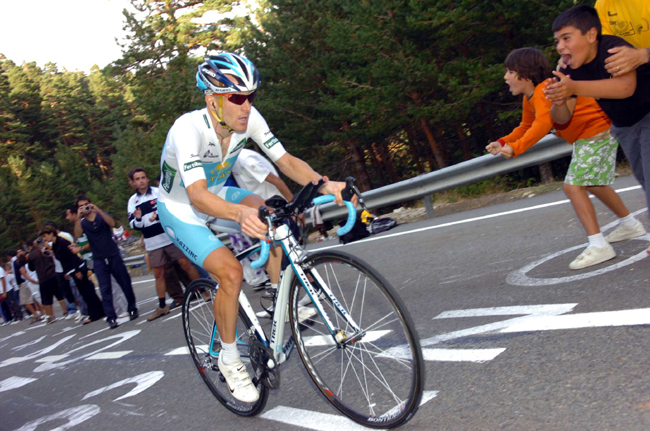 Koldo Fernandez (Euskaltel) s.t. 7. Alexandre Usov (Ag2R) s.t. 8. Mauro Santambrogio (Lampre) s.t. 9. Oscar Gatto (Gerolsteiner) s.t. 10. Sebastien Hinault (Credit Agricole) s.t. 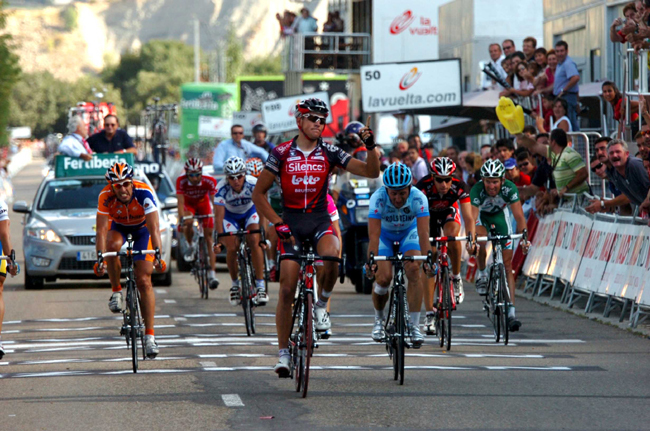 Monday, September 15: Stage 15, Cudillero - Ponferrada, 202.0 km. 3. Juan Manuel Garate (Quick Step) s.t. 8. Xabier Xandio (Caisse d'Epargne) s.t. 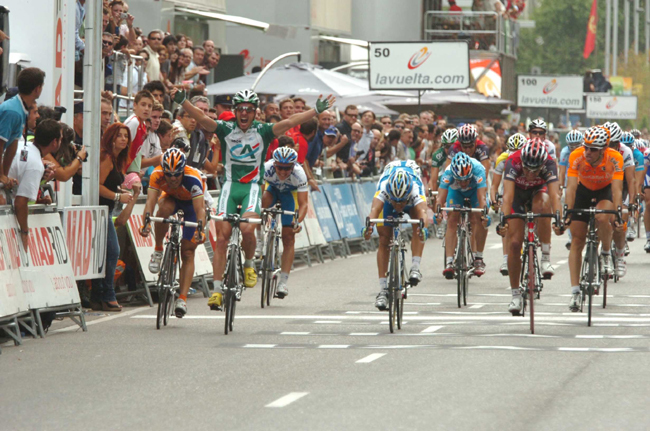 Sunday, September 14: Stage 14, Ovieto - E.E. Fuentes de Invierno, 158.4 km. 5. David Moncoutie (Cofidis) s.t. 6. Carlos Sastre (CSC-Saxo) s.t. 8. Oliver Zaugg (Gerolsteiner) s.t. 10. John Gadret (Ag2R) s.t. Saturday, September 13: Stage 13, San Vicente de la B. - Alto de L'Angliru, 209.5 km. The Angliru might be the hardest ascent in professional cycling. It looks like Contador is on his way to joining a very exclusive club made up of those riders who have won all three Grand Tours. Right now the members are Anquetil, Gimondi, Merckx and Hinault. I'd have to say that's pretty good company. Friday, September 12: Rest Day. 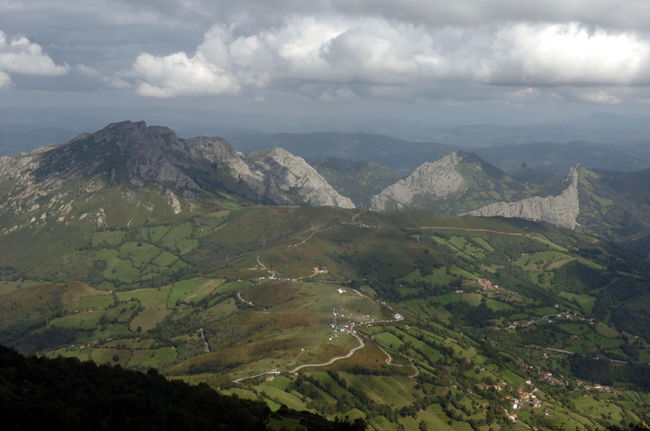 Thursday, September 11: Stage 12, Burgos - Suances, 186.4 km. 7. Oliver Zaugg (Gerolsteiner) s.t. 8. 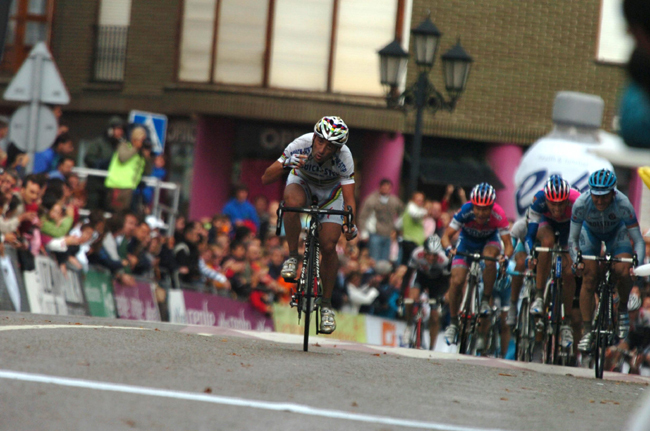 Carlos Sastre (CSC-Saxo) s.t. 9. Levi Leipheimer (Astana) s.t. 10. Igor Anton (Euskaltel) s.t. Wednesday, September 10: Stage 10, Calahorra - Burgos, 178.0 km. 3. Juan Antonio Flecha (Rabobank) s.t. 7. Xavier Florencio (Bouygues Telecom) s.t. 8. Greg Van Avermaet (Silence-Lotto) s.t. 9. Danilo Napolitano (Lampre) s.t. 10. Heinrich Haussler (Gerolsteiner) s.t. Tuesday, September 9: Stage 10, Sabinanigo - Zaragoza, 151.3 km. 2. Lloyd Mondory (Ag2R) s.t. 3. Greg Van Avermaet (Silence-Lotto) s.t. 8. Xavier Florencio (Bouygues Telecom) s.t. 9. Juan Jose Haedo (CSC-Saxo) s.t. 10. Nikita Eskov (Caisse d'Epargne) s.t. Monday, September 8: Stage 9, Vielha/Mijaran - Sabinanigo, 200.8 km. 6. Xabier Zandio (Caisse d'Epargne) s.t. 7. Patrice Halgand (Credit Agricole) s.t. 8. Christophe Kern (Credit Agricole) s.t. 10. Egoi Martinez (Euskaltel) s.t. 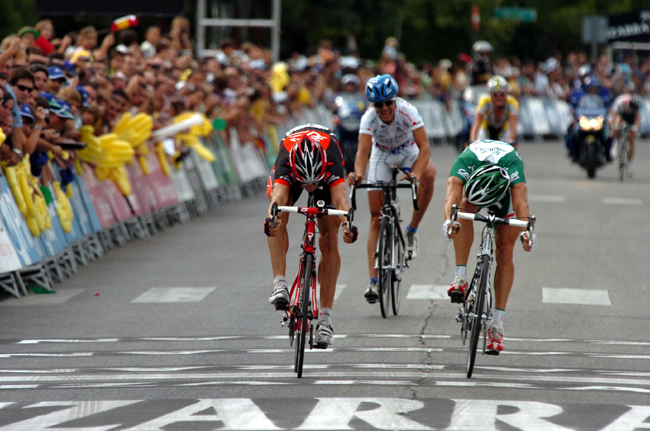 Sunday, September 7: Stage 8, Andorra - Pla de Beret, 151 km. 3. Alberto Contador (Astana) s.t. 6. Daniel Moreno (Caisse d'Epargne) s.t. 9. Davide Arroyo (Caisse d'Epargne) s.t. 10. Carlos Sastre (CSC-Saxo) s.t. Saturday, September 6: Stage 7, Barbastro - Andorra, 223.2 km. 7. Carlos Sastre (CSC-Saxo) s.t. 10. Davide Rebellin (Gerolsteiner) s.t. 8. Ezequiel Mosquera (Xacobeo-Galicia) s.t. Friday, September 5: Rest Day. 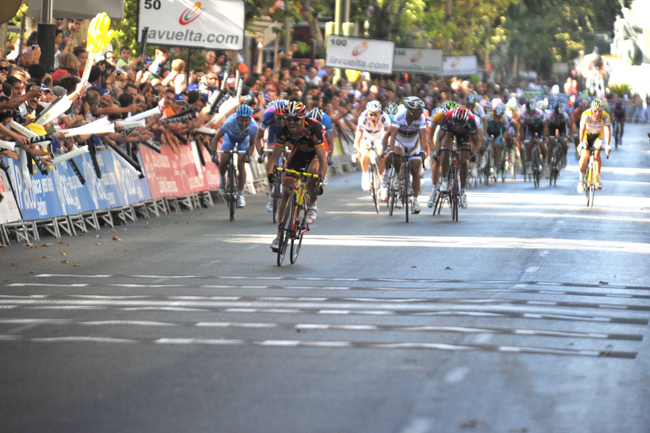 Thursday, September 4: Stage 6, Ciudad Real - Toledo, 150.1 km. 2. Philippe Gilbert (FDJ) s.t. 5. Daniele Bennati (Liquigas) s.t. 9. Karsten Kroon (CSC-Saxo) s.t. 10. Matti Breshcel (CSC-Saxo) s.t. Wednesday, Septemeber 3: Now that Levi Leipheimer has the leader's Golden Jersey, does this affect Astana's plan to bring Contador to Madrid as the winner? Here's what Leipheimer told Spanish TV (courtesy Unipublic): "I felt really strong today. But Contador is the leader of the team. He won the Tour de France and the Giro de Italy. 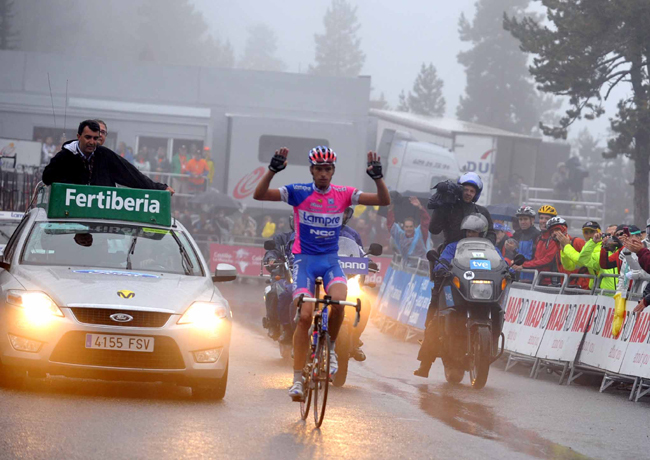 And on mountains like Andorra, Angliru and Navacerrada, Contador is the best cyclist in the world. Work for him? Yes, of course. I'm going to work for him". I'm going to wait and see. Astana team boss Bruyneel has never been one to let the world know his plans before he wants the world to know them. Wednesday, September 3: Stage 5, Ciudad Real 42.5 km Individual Time Trial. 10. Sebastian Lang (Gerolsteiner) s.t. Tuesday, September 2: Stage 4, Cordoba - Puertollano, 170.3 km. 4. Daniele Napolitano (Lampre) s.t. 5. Erik Zabel (Milram) s.t. 7. Wouter Weylandt (Quick step) s.t. 8. Davide Vigano (Quick Step) s.t. 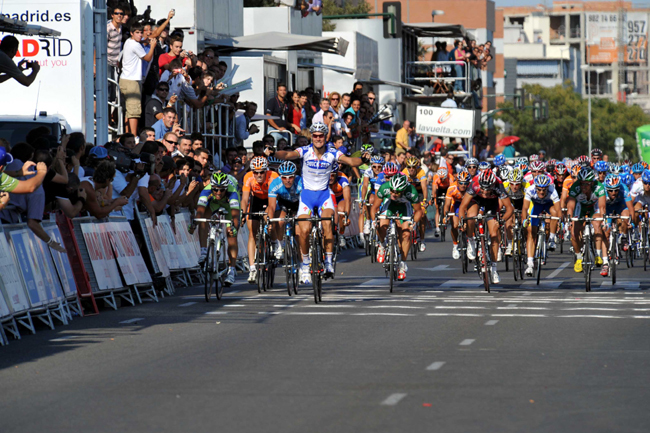 Monday, September 1: Stage 3: Jaen - Cordoba, 168.6 km. 2. Daniele Bennati (Liquigas) s.t. 5. Nicolas Roche (Credit Agricole) s.t. 9. Tom Stamsnijder (Gerolsteiner) s.t. 10. Lloyd Mondory (Ag2R) s.t. 8. Erik Zabel (Milram) s.t. Sunday, August 31: Stage 2, Granada - Jaen, 176.3 km. 4. Greg Van Avermaet (Silence-Lotto) s.t. 5. Filippo Pozzato (Liquigas) s.t. 6. Rinaldo Nocentini (Ag2R) s.t. 9. Philippe Gilbert (FDJ) s.t. 3. Daniele Bennati (Liquigas) s.t. 8. Igor Anton (Euskaltel) s.t. 9. Ruben Perez (Euskaltel) s.t. 10. 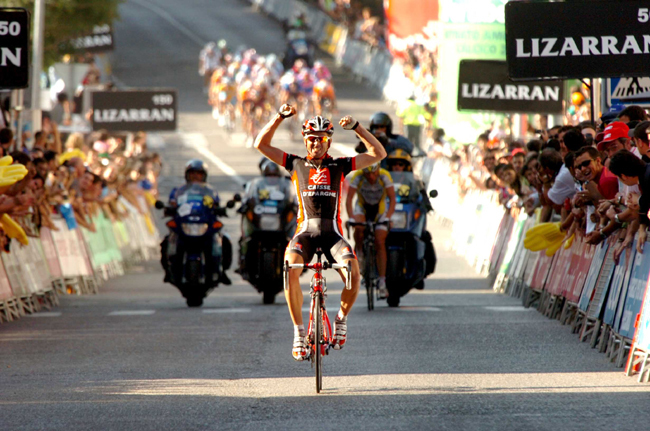 Mikel Astarloza (Euskaltel) s.t. Saturday, August 30: Stage 1, Granada 7.7 km Team Time Trial. 2. Valerio Agnoli (Liquigas) s.t. 3. 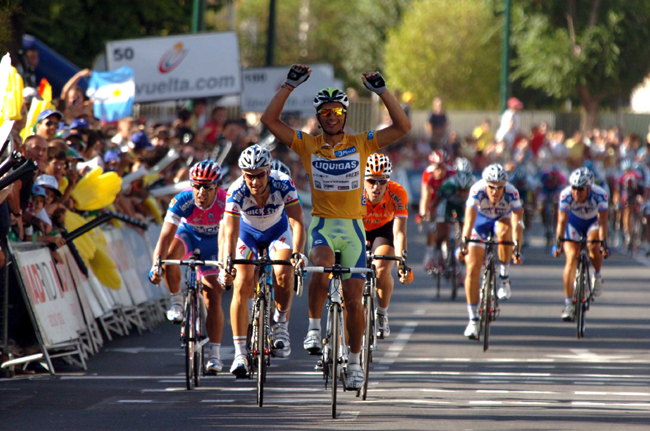 Manuel Quinziato (Liquigas) s.t. 4. Daniele Bennati (Liquigas) s.t. 5. 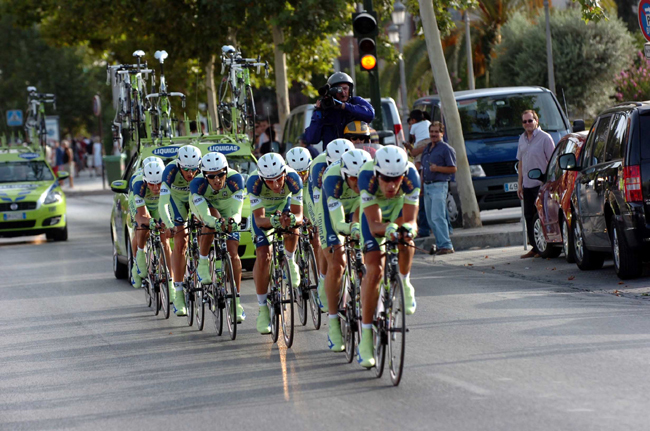 Alessandro Vanotti (Liquigas) s.t. 6. Enrico Franzoi (liquigas) s.t. 9. Koldo Fernandez de Larrea (Euskaltel) s,t. 10. Mikel Astarloza (Euskatel) s.t.